Sgian dubh is translated from Gaelic as ‘hidden knife’ and that’s how the sgian dubh is worn, hidden inside the hose (socks) with just the top handle visible. 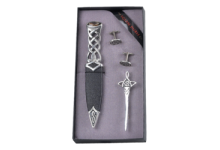 At Claymore Engraving we have a wide selection of Sgian dubh's which will compliment any Wedding Party or Special Functions. 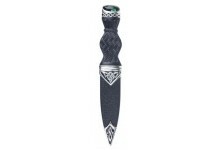 A black resin sgian dubh which features a blunted blade. Latticework pewter secures a coloured st..
Tay 3 Piece Polished Pewter Gift Set with Coloured Stone Top. Choose a stone to match a kilt ..